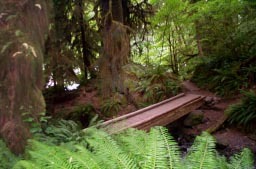 The Hoh Rain Forest Trail is one of the more popular trails in the Olympic National Park. 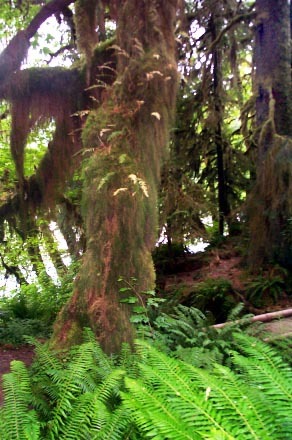 Its fame is more than local; the Hoh Rain Forest is a world heritage site, one of the great temperate rain forests. In August, it is interesting to come and hear all the foreign languages spoken as one walks along the trail. The great trees, firs and cedars, the lush ferns and the fascinating mosses are the main attractions. This is true rain forest with ferns, vines and mosses growing out of the trees, making them look like the trees in Disney's animated Tarzan. Take route 101 south past Forks and watch for the signs about 15 miles south of town. Take the left turn and follow the Hoh River up into the National Park and continue to the end of the road. The road is well paved , and everything is nicely marked. There are actually a number of things to do and see here. In the late spring, you don't have to go far from the ranger station to see wildlife. Early one spring, we found four male elk in the lot itself. There is also a neat little swamp on the left right before you get to the lot. If you have just taken the Bogachiel Trail or Switchback Trail to Klahane Ridge, exhaustion might force you to settle for the little nature trail or exploring the Hall of Mosses. We call it the Hall of Sponges, perhaps out of respect for the National Migratory Sponge Act, but it provides an excellent introduction to the area, explaining symbiosis, nurse logs and the like. 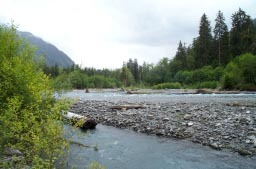 However, the main attraction is the Hoh River Trail itself. This trail follows the course of the river up towards Mount Olympus, ending in the high glacial fields at its base. We, ourselves, have never gotten that far, but what we have seen is impressive. The trail, as we know it, is not particularly strenuous and does not have many rough spots. Now and then one may actually have to watch one's step when crossing a stream. The payoffs, in the form of great trees and wild ferns start early, and the first mile or two of the trail can be relatively crowded. In August, the high season, the entire trail can be extremely crowded with casual day hikers blocking the way of hard striding campers with their full packs. Oh yes, sometimes there are horses and llamas. This is one of the most haunting and lovely day hikes in the region. The light alone is worth the trip. On sunny days great shafts of emerald cut through the trees to the mossy forest floor; on cloudy days you are wrapped in mystery. The best thing about the trail is the frequent river turnouts and views. The Hoh itself is a glacial river and is often an unearthly milky blue from the dissolved minerals. There are a number of side spurs from the main trail to the river's edge, including the Tom's Creek and Five Mile camping areas. Here, one can walk out on the flow rounded rocks and explore the driftwood, or sit and catch views of the distant mountains ahead on the trail. Both these places are great for picnics. If you have the stamina, and proper equipment, you can head on upriver and explore those mountains yourself, or, like us, you can head back home. The Hoh River Trail has wonderful things for everyone, ranging from short nature walks to alpine adventures. Watch out for wasp season in late August. The wasps are not aggressive, and nests are usually well marked by the park service. If they do come out, just don't thrash around. Let them check you out and go their way. We have picnicked along the river while they have buzzed around our shoes, but have never been stung. If you are seriously allergic, you might want to avoid this trail during wasp season, or bring an epi pen. Since this is, after all, a rainforest, you are likely to encounter some rain, even if the weather is sunny back in Port Angeles. Take a light poncho or raincoat in a breathable fabric and keep walking. If you do make it up to the glacial valley, do not go exploring alone. It can be really dangerous and people have died just a ways off the trail. The Hoh River Trail can get crowded in season. You might want to try the similar, but much less used Bogachiel Trail instead. UPDATE - For some pictures of the 2006 winter storm damage, check out our special Kaleberg report.